Fieldwork Under Fire is a path-breaking collection of essays written by anthropologists who have experienced the unpredictability and trauma of political violence firsthand. These essays combine theoretical, ethnographic, and methodological points of view to illuminate the processes and solutions that characterize life in dangerous places. They describe the first, often harrowing, experience of violence, the personal and professional problems that arise as troubles escalate, and the often surprising creative strategies people use to survive. 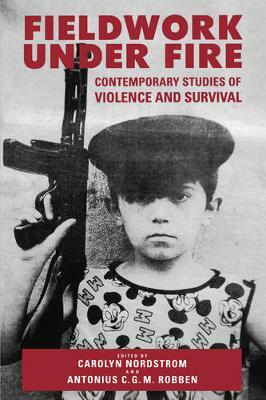 In "writing violence," the authors give voice to all those affected by the conditions of violence: perpetrators as well as victims, civilians and specialists, black marketeers and heroes, jackals and researchers. Focusing on everyday experiences, these essays bring to light the puzzling contradictions of lives disturbed by violence: the simultaneous existence of laughter and suffering, of fear and hope. By doing so, they challenge the narrow conceptualization that associates violence with death and war, arguing that instead it must be considered a dimension of living.